Gutters provide your home’s waterproofing and weatherproofing so it’s essential to have the system installed correctly and regularly maintained. It’s quite common to find a build-up of dirt and water in the guttering, which can cause blockages. 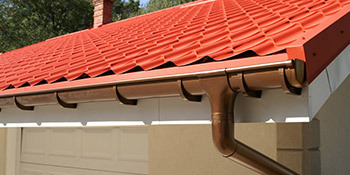 The installation of guttering is also a tricky business and needs to be carried out by a fully qualified professional. The brackets and pipework need to be securely fastened to your home and the drainage needs to be correctly calculated. As rain falls onto your house, it runs down the slopes on either side and off the edge of the roof. With gutters securely fitted, this water can be channelled down the spout and into the drain. Without a suitable guttering system the water would simply fall off the house’s edge and could damage the foundations in the long run. Unnecessary moist would also affect the house and could seep through the walls, creating dark spots and mould. And for similar reasons, the upkeep of gutters needs to thorough and a full clearance should be completed at least twice a year. Gutters located under trees are more likely to pick up debris and leaves, and leaving this until winter could result in water freezing. This would have a negative effect on the guttering and could put excess strain on the brackets, which will lead to damage over time. Excess water can also start to cause rust and any leaks could seep into the house, damaging walls and forming mould. This will just pile up the pounds you’d have to spend on repair. Project: Customer visited the myguttering.co.uk site and submitted an enquiry. Property type: Semi detached, Property owner: Owner, Work description: To all be replaced. Did not ask for quote as pleased with quote already received. Polite and courteous. Really good work, Work very hard as as a team. Facia and sofitts look lovely. Very clean took away all old facia.. Good price. Would definately recommend these guys. Easy and fast to get contractors. Had difficulties getting reliable tradesmen. Did not over do the company quote list. kept in touch throughout. Homes are given an energy score dependent on just how efficient they are and ratings are presented in the data below. This ranges from A, by far the most energy efficient, to G, the least efficient. With a higher rating you're more likely to have less expensive energy bills as more heat is going to be retained in your home. You can improve your home's efficiency with insulation such as double glazing, loft lagging or wall cavity insulation. The data underneath indicates the numerous types of homes in Uk. By far the most common houses throughout the UK are detached and semi-detached homes. Various other houses include terraced houses, flats, converted flats and bungalows. The data below offers an indication for the number of properties in Uk that are central heated and non-central heated. Properties are heated by a variety of sources which indicate how pricey yearly energy bills will probably be. Examples of central heating include gas, electricity, oil, solid fuel and LPG boilers. Changing the way in which your property is heated can see you with cheaper bills. The data beneath displays the spread of properties warmed by various fuels. Around the UK the most frequent by far are gas heated homes, followed by electricity and then oil. Biomass boilers are also rising in popularity, heated by eco-friendly products such as wood pellets or agricultural waste.|Properties in Britain are warmed by a variety of fuels, such as gas, electricity, oil, solid fuel and LPG boilers. Each fuel has a varying cost associated with it so you could find yourself with less costly energy bills by altering the way your home is heated. Even solar thermal panels are being considered by many as a way to cut heating bills for the years to come.